I was stood waiting for a taxi at the airport last night thinking these 20 people in front might be going to the same place as me, or close, or on my way. 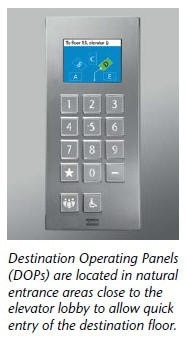 And then I thought about a meeting I had in a building in Sydney that had destination control lifts – type in the floor you want to go to and it tells you which lift to get – less energy, less travel time, cool. Why not combine the two? Destination control autonomous cars. As you approach the taxi waiting area you type in your postcode and a number appears on the display saying taxi number 6. You approach taxi number 6 and there already 2 people in the car. You stick your luggage in the boot, take your seat and the taxi announces that you are waiting 5 minutes for another passenger you has just arrived at the rank. Once the other passenger arrives the taxi tells you the order which you will be dropped off in based on traffic, fuel use and locations. The automated taxi system (ATS) has already calculated the cost for each passenger and as you leave the taxi you swipe your credit card to pay. The journey may take slightly longer but the cost is significantly less because the Australian government had the foresight to charge for the externalised cost of resource use, which drove massive in roads to not only resource efficiency but also resource productivity. You laugh to yourself in a moment of nostalgia from the last manned single destination taxi ride you took 5 years ago. Smart devices would also enable you to use destination control autonomous cars (DCAC) or automated taxi systems (ATS) to enter the postcode, street address and arrival time for booking a taxi. The app would then let you know three options that you can select – sole passenger (bloody expensive but 15 mins travel time), two drops (not so expensive and 18 mins travel time) or three drops (cheapest and 20 mins travel time, plus there is one of your LinkedIn connections in the same car). You select the third option, chat with your LinkedIn connection on the way, win a new project, have a cup of tea and marvel at the wonder of not having to find the street address in a paper book of maps for the taxi driver. As you leave the automated taxi you swipe your card for payment and the taxi says in a slightly Disney’esque voice “Thank you Mr Wild, have a magical day.” Awesome. It gives the local councils a lot of data about when and where people use taxis rather than continuing their journey on other public transport – allows them to better plan their infrastructure and operations. It works out your preferences over time, knows your common destinations and learns to make sure there is a DCAC nearby for your regular trip to Parramatta. It would greatly improve the management of people movement around our ever increasingly denser cities.